After trying out the demos of all the DAWs possible. I finally settle for Reaper. Here’s why. Its cheap. Seriously $60 (if you are like me, a music hobbyist) for a DAW that does everything all the major DAWs do.? Yes it lacks in some features. It has no VST instruments. But with some research online you can find that there are plenty of Free VST instruments for you. Which can do almost everything that the instruments most of the DAWs offer. A good piano? Piano One. A good synth? There is Tone Bird, FMMF, and plenty more. More instruments?, There is DSK free collection of instruments that you can use. There is Alchemy who shell out plenty of good instruments to demo their line of virtual instruments that you can buy. NI (Native Instruments) give you some instruments to use so that you would buy their collection later and yes, you will :). The number of things you can tweak in this DAW are literally endless. Everything that you can possibly think of, there’s always a way to do it, a short cut that can be assigned to it or, an easier way to do it. Every little Keyboard shortcut or Mouse Action can be changed. You can make your DAW look like how you want it to look like. The user community is great. There are loads of good people who come for rescue when you do not know how to tackle some specific situation. There are loads of people who make plugins, themes and scripts to help you do commonly tasks easier. Vast library of plugins. Do not be disappointed at how the the plugins look like in reaper and oh the Js Plugins, don’t get me started. But, There is more to them that what they seem like. If you know to wield your sword, you are in for a real treat. At first I couldn’t get myself to use plugins that look so plain and simple. We are so used to plugins with really good UIs that it takes some time to actually get over it. But after two months of using them, the simplicity actually makes sense to me now. Now I PREFER using the Rea Plugins for the very reason I was not interested in them at first. The Looks!. It just gets the job done quickly. I also assure you that it will take quite sometime to actually experiment with all the plugins that come with reaper. The functionalities are very straight forward. The work flow is amazing and what’s not to like when you can tweak Reaper to bend to your workflow! Its Light!. So light that you can carry it around in a pen drive. Downloads and updates are a bliss. It hardly takes me 5 minutes to update the whole software. Let me just say that the size could be less than the size of a song you would produce in it! I do accept that in order to fully utilize all of reaper’s functionalities it will take you a really long time and some might find the learning curve to be a bit steep as well especially because of the Trust factor(you need to trust your DAW can do everything). But if you are new to using DAWs and if this is your first DAW, you’re gonna have to learn all the functionalities anyways so it doesn’t make a difference. I’ve listed just a very small portion of the positives I have experienced with Reaper. I also need to talk about the negatives as well. Nothing is perfect. But the good thing about this is that it’s not a long list. The first and foremost problem that comes to my mind is the delay before playback whilst using VSTs. There is a good solid 1-2 second delay based on the number of plugins you use for a particular project. The audio plugins that come with reaper do not cause any delay. But external VSTs do cause a problem. I have not investigated this over at the forum. Did not bother me enough to spend time on investigating it. But I have a feeling those guys over there would have a solution for that as well. Eh….. That’s it. Nothing else comes to mind. I guess that’s a good thing. I’ll wrap this up. This is one of those topics that you need to understand. To be honest, most of the stuff in this series will be conceptual, which will help you to apply them when situations arise. Instead of giving you specific solutions, making you understand would be the best way, because when you understand you can apply your mind and solve things in any DAW. Although I would try to give you examples of how to do it specifically in some DAW. Latency is the time difference between the input you give such as an Audio Signal or a Key Press on the keyboard, and the response to your input that your Musical Setup provides. You are playing a VST instrument, and there is a time difference between the moment you hit a note on the keyboard and the sound being produced by the DAW. This is latency too. In any case the result is pretty annoying and it needs to be solved. 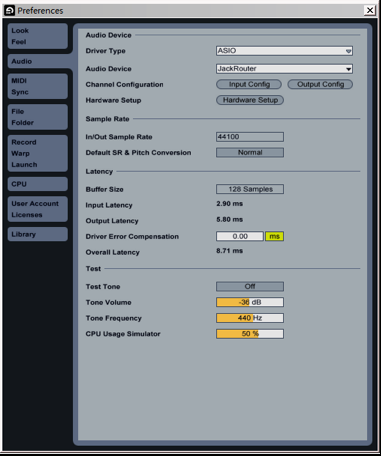 In situations where a computer’s own sound card is used, latency is very common. Unless your sound card is really powerful. This doesn’t mean that there are no latency issues when you use an Audio Interface. Just that it is not that common. Anyway, so you are having latency issues although you are using your Audio Interface. The fix usually lies in either the Audio Interface preferences or the DAW preferences or both. Open the properties of your Audio Interface. I have a screenshot of the properties of my Audio Interface. I switched to the Latency Tab. This is where you get to tweak. Shown below is a scale of the amount of data the Audio Interface collects before sending it to the Computer. Lower the amount lesser the latency. But it is suggested by many people that you don’t go below 128. Ok, You don’t get how lowering this can reduce the latency. Imagine this situation. There is a guy packing boxes and there is another loading them into a truck. If the first guy has a huge box. It would take a long time for him to pack this box and pass it on to the next guy right.? But what if he had small boxes. He would pass on more boxes every hour or minute or what ever unit of time you are considering. Although end of the day we would complete the work in the same time. What really matters for us is whether there is a continuous flow of boxes. That’s the case with the Audio Interface too. We need real time processing. A continuous supply of Audio Data. The second way would be to tweak some preferences in your DAW. 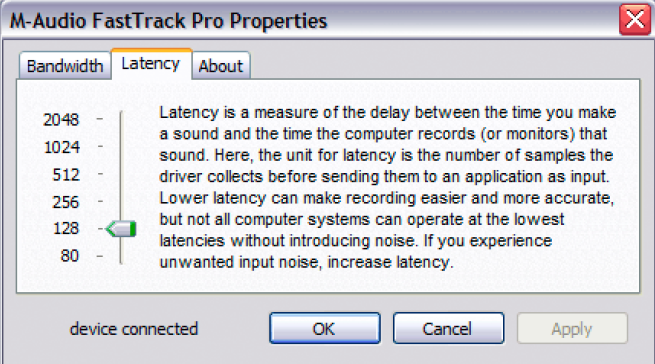 Every DAW will come with preferences to compensate for Latency that cannot be avoided. Shown below is a screen shot of the preferences. Change the ‘Driver Error Compensation’ to reduce latency. Although I believe that the first solution will solve the problem for sure. This would be a supplementary method to solve things. You can also use the Test Tone in Ableton to check if you would have Latency. Click the Button where is says ‘Off’ next to ‘Test Tone’. This will switch on the Test Tone which is one of those continuous single frequency sine wave sounds. If there is a problem with your latency, then this tone will sound distorted with noise. Simple enough?. Yes! If you have any questions, comment here or drop a mail at johananj@yahoo.com and I’ll be happy to reply. Thanks for Reading. Make some MUSIC yo’all! !